Has Delhi-6 lived up to expectations? Do you feel that Delhi 6 is one of Rahman�s greatest soundtracks? Chandni Chowk can be an awe-inspiring place to be in, not only for its popular eateries and shops which date back to the last century, but also because in essence it represents the quintessential Delhi or more appropriately a “mini India”. For Rakeysh Omprakash Mehra’s Delhi-6, this celebrated locality (with the pincode 110 006, hence Delhi-6) provides an inspiring backdrop to an episodical tale about a handful of characters that are as diverse as the city itself and who represent the one billion population of the Indian republic. Mehra has often insisted that the city of Delhi is a pivotal character in the film rather than being a mere backdrop. He couldn’t have been more correct. Old Delhi in particular, where the film is set, is a living symbol of the country’s contrasting cultures and beliefs and also a reminder of her rich past epitomized largely by the bygone Mughal era. In Delhi-6, Mehra along with his gifted writers (Prasoon Joshi and Kamlesh Pandey) exploit this fact with panache to present characters that have been handpicked from every corner of the country; who convey a myriad of emotions and actions. These are everyday-characters that you can relate to easily and you may as well see yourself in one of them. The main protagonists of the film are Roshan and Bittu. Roshan (Abhishek Bachchan) is an Indian American visiting India for the first time with his ailing grandmother (Waheeda Rahman). His supposedly short visit to drop his Dadi in Chandni Chowk turns out to be much longer when he embarks on a journey to discover his ancestral country’s rich culture, diverse religions, conflicting beliefs and a neighbourhood of distinct individuals including Bittu (Sonam Kapoor) for whom he develops a liking. Bittu on the other hand is a middle-class girl who wants to be independent and make a name for herself by participating in the reality show, Indian Idol, but only to be stopped by her old-fashioned conservative father, Madan Gopal (Om Puri). Other notable characters include that of Jalebi (Divya Dutta) who is considered to be an untouchable in public but at the same time exploited as an object of sexual pleasure in private company; and Inspector Ranvijay (Vijay Raaz), a stubborn and corrupted neighborhood cop who enjoys being the boss wherever he goes. Mehra’s films have always been inspired by The Ramayana celebrating the victory of good over evil, be it Aks or even Rang De Basanti. For Delhi-6 he uses various episodes from the age-old theatrical play Ram Leela that have been seamlessly interspersed with the narrative, compelling us to rethink about the way we perceive ourselves, those around us and our society in general. There’s a beautifully executed sequence where Roshan is asked to purify himself having touched the untouchable and low-caste Jalebi, a blasphemous act in the locality. Almost immediately Mehra shifts the action to the Ram Leela where ideas of discrimination based on social status and caste are being banished and the equality of all living beings is being preached. The interplay between these two significant scenes is one of the many examples of how the writers have intelligently used the epic Scripture to portray the many virtues and vices that we as human beings may have within us. Mehra and his co-writers have scripted a very relevant story that has a universal appeal and is appropriately set in contemporary India, underlying the idea that India works because her citizens make it work; there is calm and a fine balance in the country in spite of the diverse teeming population and the chaos that accompanies it. The moral of the story is well-intentioned and may well serve as an important lesson for people in these difficult times. The film stresses on the fact that one should look within himself to discover his morality and frailty and make an attempt to get rid of any vices from the inner-self. The beast within is very cleverly represented by the Kala Bandar (Monkey Man) who is shown to be creating a menace throughout the city disrupting peace and harmony and is also the cause of many unpleasant events that unfold post-intermission, chiefly that of the divide between Hindus and Muslims. Numerous other small but significant nuances give considerable depth and a deeper meaning to the film; there are two of them which stand out, the symbolic scene where a pregnant cow gives birth to its calf in the middle of a busy road which is considered sacred and the unconditional love that Roshan receives from his neighbors on his arrival in Chandni Chowk despite meeting them for the first time, portraying the fact that even if those people are just normal middle class citizens, they have a big heart and they lead a content and happy life by spreading love around them. The latter is synonymous with what Delhi is popularly known to be – “Dilwalon ki Dilli”. Delhi-6 brings together a dream ensemble cast. Where else would you find an unbelievably talented bunch of actors like Waheeda Rahman, Supriya Pathak, Divya Dutta, Om Puri, Atul Kulkarni, Prem Chopra, Vijay Raaz and Rishi Kapoor together in one single film? These actors genuinely raise the bar of the film and they execute Mehra’s vision flawlessly. It is difficult to single out a performance that stands out from the rest but for the sake of making a choice, I would rate Divya Dutta’s bravura act as the foul-mouthed Jalebi a point higher than the rest of the cast. It is fascinating to watch the talented actress slip into a very challenging character so effortlessly and special brownie points to her for carrying off that heavy accent with such rare flair. Providing ample support as the film’s protagonists are the two leads, Abhishek Bachchan and Sonam Kapoor. 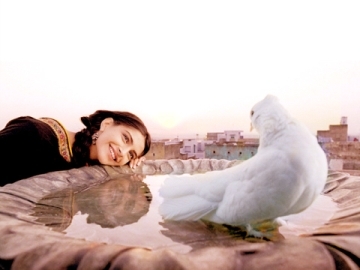 Sonam’s stunning debut in Saawariya was only a small glimpse of her acting prowess. She has evolved into a very fine actor with Delhi-6 and apart from looking more beautiful than ever, she delivers a very dignified performance. Unlike in her debut vehicle, she has dealt with a more diverse set of emotions in this film, from being cheerful to expressing rebellion and anger. Abhishek Bachchan does not have too many lines to say but he uses that silence to his advantage, combines it with brilliant expressions and gestures, and lights up every frame he occupies. Given the right character and director, this often underrated actor can do wonders. Much like in Mehra’s Rang De Basanti, music here is an integral part of the narrative rather than being a mere showcase for the film. While some may be disappointed with the picturization of tracks like Rehna Tu and Bhor Bhaye, Mehra uses them intelligently to portray important aspects of the film, the best example being Rehna Tu which contrary to popular belief is used to romantically interpret one’s affection towards the city of Delhi and not to depict the romance between Roshan and Bittu. A. R. Rahman’s beautiful melody combined with Prasoon Joshi’s sublime poetry and the director’s out-of-the box thinking makes this track very special which is reminiscent of Luka Chhupi from Rang De Basanti. However, the icing on the cake turns out to be the robust title track which gives Delhi a contemporary anthem to sing along to. Rahman also scores the background music which is more effective post-intermission, suitably complemented by excellent sound design. Binod Pradhan’s cinematography is best termed as intimate. It is evident from the film’s stunning visuals that he loves every corner of the walled city and with his long-proven expertise with the camera, he gives shape to the director’s vision flawlessly, never once going over the top and maintaining perfect balance between depth and clarity. The Jama Masjid, Ram Leela and the climax have been especially well shot. Dialogues are effective throughout and thought-provoking at times. Editing by P.S. Bharthi is very well done which limits the film’s length to an acceptable 2 hours 18 minutes running time. Also laudable are the production design by Samir Chanda and appealing choreography (Masakali, Genda Phool) by Vaibhavi Merchant. Dil Gira Dafatan has been innovatively choreographed where the characters from Chandni Chowk, even the actors from the Ram Leela, are transported to New York’s Times Square. Although the purpose of this fantasized sequence may only be clear to the discerning audience, it still looks appealing enough to please anyone and everyone. Rakeysh Omprakash Mehra had shot two contrasting versions of the film’s ending and if you have been an ardent follower of Mehra’s previous films, then the finale of Delhi-6, in which Mehra has tried to play safe, may surprise you which will quite likely be met with differences in opinions. Nevertheless, Delhi-6 is an unforgettable cinematic experience. A universal film in all respects, connoisseurs of good cinema will lap it up whole heartedly. It is that rare gem of a film that will be remembered and discussed for many more years to come. Very highly recommended.